After making their way through high school (twice), big changes are in store for officers Schmidt (Jonah Hill) and Jenko (Channing Tatum) when they go deep undercover at a local college. But when Jenko meets a kindred spirit on the football team, and Schmidt infiltrates the bohemian art major scene, they begin to question their partnership. Now they don't have to just crack the case - they have to figure out if they can have a mature relationship. If these two overgrown adolescents can grow from freshmen into real men, college might be the best thing that ever happened to them. Written by Sony Pictures Entertainment"
First off, this non-teenage looking human did not see 21 Jump Street. So no idea what happened there other than what I've read on IMDB. But let me say this, after watching 22 Jump Street. I just might. 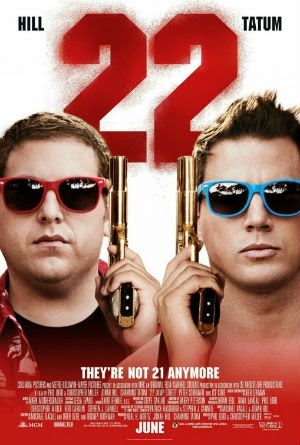 22 Jump Street has the two bumbling and bungling heroes graduate from looking too old to be in high school to being too old to be in college. Sadly only Jonah Hill's character gets picked on for looking too old though. Sad for his character that is but he really does look old. This movie does not take itself seriously. Seriously. If you take this movie seriously then either your brain is too old, your attitude too old or maybe you're just too old. This is a very entertaining movie. A good, shut down your brain and just go with the flow movie. Never has a bromance movie, and this is a serious bromance movie been as entertaining in a very long while. There was of course Bad Boys I and II but if you compare those to this then you are too old. Channing Tatum and Jonah Hill are a pretty good at playing off each other and truthfully some dialogue actually felt like they were ad-libbed. If you want a good weekend movie to take your girlfriend, boyfriend, wife, husband, monkey on a leash, guinea pig in handbag or cat in a hat then this one is a pretty good one. Go for a laugh and a giggle. What else is there to do anyway? And stay for the credits, They are a hoot! !